Have You Been to the Derby Yet? Have you been to derby yet? Roller derby seems to be reaching a ‘tipping point’ in our current cultural context, and all kinds of girls and women (with men and boys cheering them on) are in on the game. Leagues are springing up all over the place, in large cities and small towns, fielding competitive, recreational, and even junior teams. These girls and women look like they are having fun, and the atmosphere is celebratory and welcoming: ‘Come Join Us!’ is a common refrain. 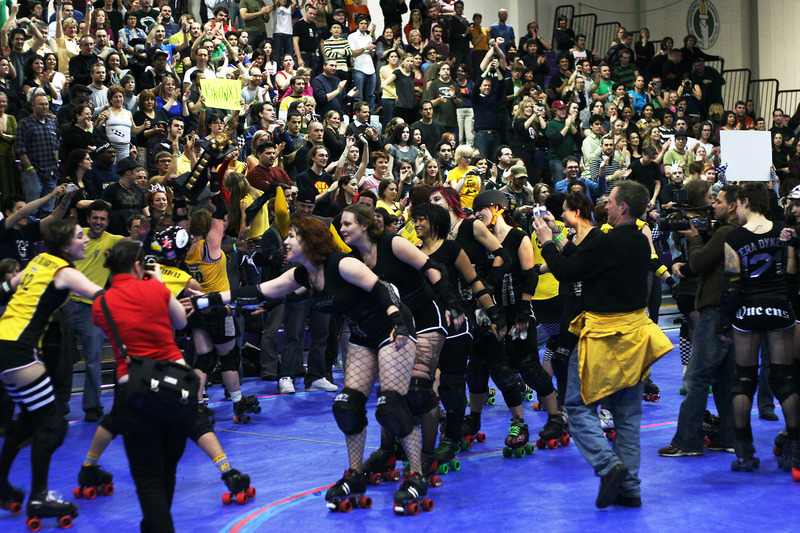 As far as I can see, in roller derby (as Annie Lennox famously sang), “Sisters are doin’ it for themselves”. What they are doing is being outrageous: wearing outrageous clothing, taking outrageous names (skaters like JANEgerous, or Short Fuse on teams with names like Bay City Bruisers) and having outrageous fun. Don’t get me wrong: you won’t see me on the track any time soon. It looks like it hurts, and quite frankly, like my friend Samantha Brennan says in her blog Fit, Feminist, and (almost) Fifty, I’m too old to get hurt like that. But I love the fact that derby exists, and I love the fact that derby provides a space where women and girls can be beautiful, physical, and intense, on their own terms and for their own purposes. I wonder what it would take to make online social spaces more like roller derby and less like the ‘Legends’ Football League? I’m not just talking about substituting mouthguards for the current ‘duck face’ aesthetic, though that would go a long way. I’m talking about privileging function over form; I’m talking about representing all of who we are and who we want to be; and I am talking about having fun (and, yes, being outrageous). Of course, it won’t work if we do it alone – but then, one person hardly makes a roller derby league. It takes a whole team – and maybe we can start one!